Hi, considering Emby over Plex (long time subscriber) mainly because of the Plex UI changes. I will start a subscription shortly, but am using the free version right now. 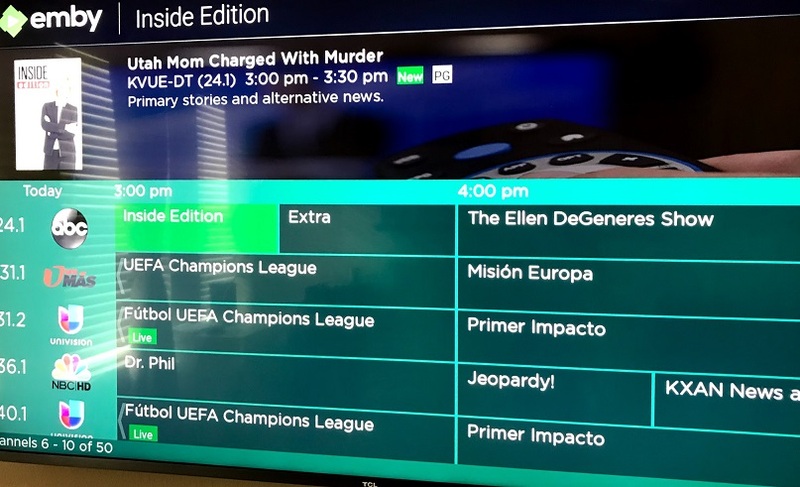 ---DVR functionality on Roku, can I set recordings from the Roku, and is it done from a grid type guide or something else? I've been looking for screenshots, can't find any. If anyone has any links to videos/screenshots, etc of the DVR functionality running and being setup on a Roku, it is much appreciated. It's a grid. I prefer it to Plex. I prefer the Emby Roku client to Plex in general, actually. However, being Roku, there are some limitations: Guide scrolling is a little slow because each page refreshes as you scroll down/up. This isn't as bad as it sounds, but it is not a smooth experience. You can't view the guide while watching a channel, you have to stop playback. And, you can't record while watching a channel, you also have to stop playback, then select it again, then record. You can watch recordings in progress, however. These are due mostly to the limitations imposed by Roku. The guide experience on Android TV, by way of contrast, is much better - it displays more, smoothly scrolls, you can record and pull up the guide while watching a channel, and for some services (like HDHRs) playback and channel changes are quicker. The Emby Android client has gotten really good in general over the last year and I prefer it. The Roku is perfectly fine, however, and better than Plex (I have both). I haven't used Roku in a while but it's a grid guide as are all Emby Apps but you can easily choose a Channels Guide too.. or On Now which remembers what you watch most often. 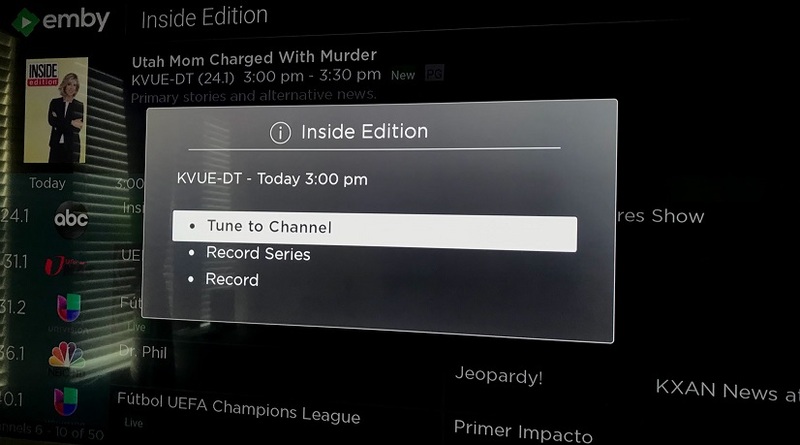 ---DVR functionality on Roku, can I set recordings from the Roku, and is it done from a grid type guide or something else?